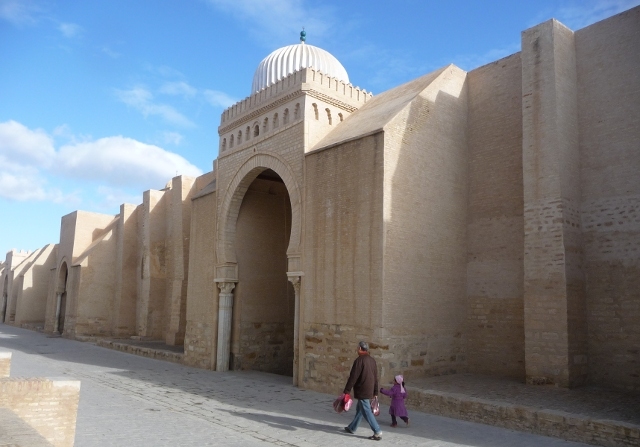 Kairouan is the fourth most holy place in the Islamic world after Mecca, Medina and Jerusalem, and is Tunisia’s spiritual heart. It was also its capital city from the 7th to the 9th centuries, was North Africa’s first Arab capital, and is a UNESCO World Heritage site. There’s a lot to see. After breakfasting at our hotel, we strolled the short way through the gateway in the city walls and into the Medina (old town – incidentally the word does derive from that holy city mentioned above and applies to the mediaeval quarters of Arab towns and cities). 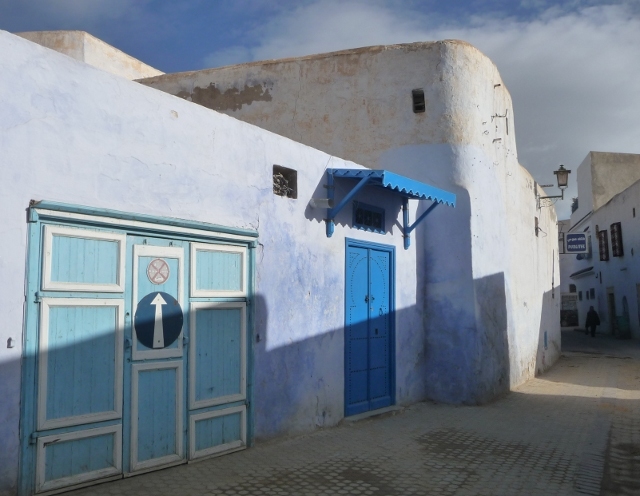 It was warm in the sun and the light reflected off the white washed houses, many with the traditional blue doors, and gave for an airy bright feel inspite of the narrow passageways. The bustle of the souks and town’s people going about their morning was as alluring as ever. A fish stall with umpteen cats thronging around it, made us stop for a photo and the fish man welcomed the chance to pose, pushing a customer out of the way so we could get a better shot. Our first stop was the 9th century Grand Mosque. The mosque is one of the oldest and largest in the country and looks like a fortress from the outside. Its huge courtyard also served to collect rainwater and channel it through a central drain into cisterns below ground. The drain has notches which were designed to filter out dust from the water. We got a good view into the prayer hall with its floor covered in sumptuous carpets, though as non-Muslims we couldn’t go inside. Our ticket also provided entry to several other sites in the city and we wandered the maze of streets in search of them and other buildings that had to be seen, such as the Mosque with Three Doors. Meanwhile we were tempted into a weaving workshop and I had a go of sorts at the loom. We were also cajoled into a former palace which was now a carpet shop. 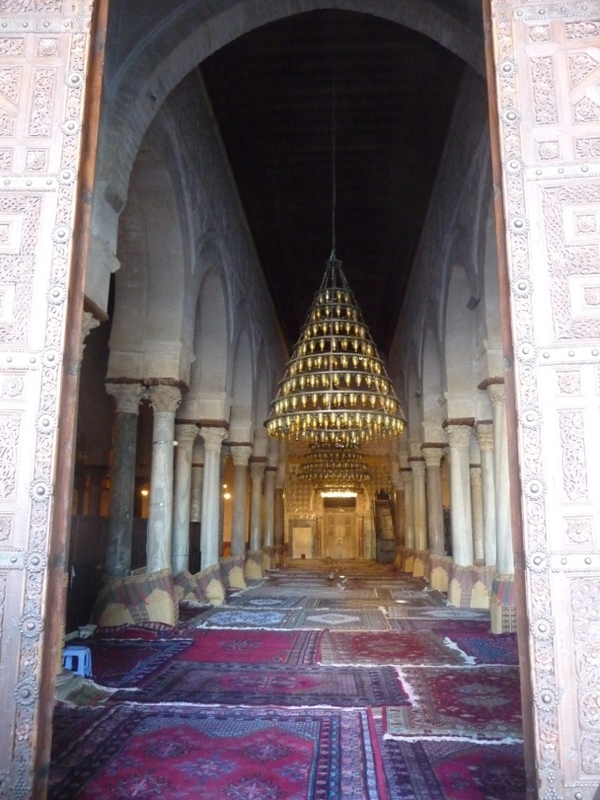 Kairouan is also famed for its carpets and they are wonderful. We were shown the intricate ceilings and sumptuous furnishings, but managed to escape before the hard sell on the carpets. Eventually we found the Zaouia of Sidi el Ghariani, entry to which was on our ticket. A zaouia is a sanctuary devoted to a marabout – a holy man or saint – built around his tomb. They can be a simple domed building or an elaborate palatial complex used as a shrine, a mosque and maybe a madersa (seminary) too. 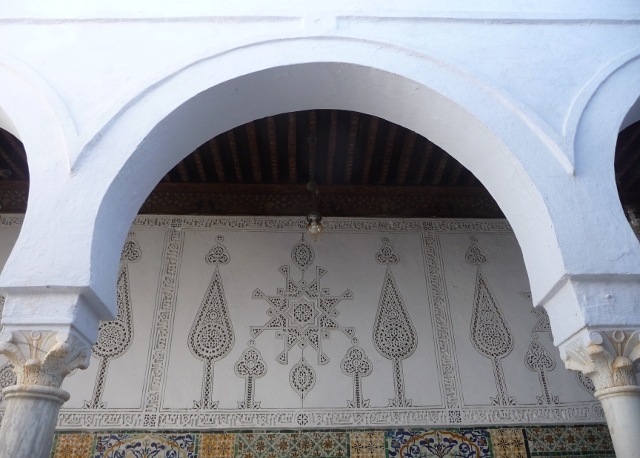 This one was a palace with the wonderful features of Islamic art and architecture – the carving, the tiling, the colonnaded courtyards. Light and space and details wherever you looked, and intriguing halls leading off the main area. Zaouias of different elaborateness can be spotted all over North Africa and in the early centuries of Islam, these men played a part in bringing the faith to the Berber peoples. We had two more zaouias to see in the city. 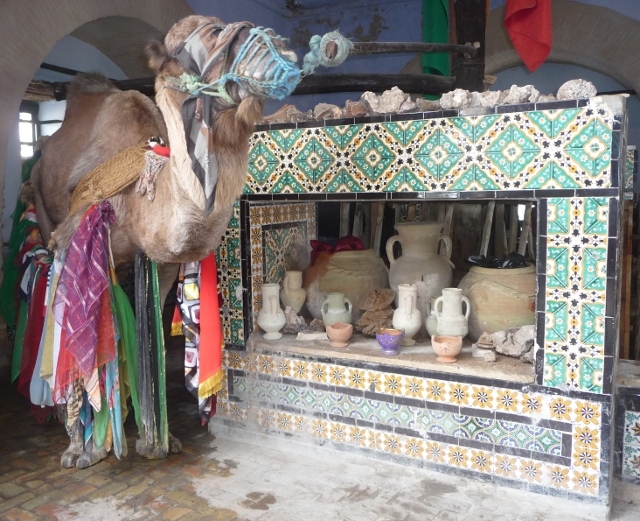 On our meanderings through the souks to find the way out to the next one, we came across the Bir Barouta, which is a well, only it’s upstairs and has a camel trained to walk around it to commands to draw up the water bucket. 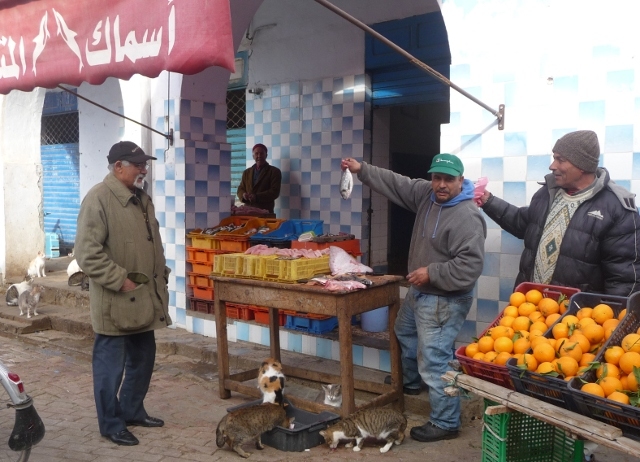 A taste of the water will bring you back to Kairouan, so the story goes. Adrian will be coming back without me then! 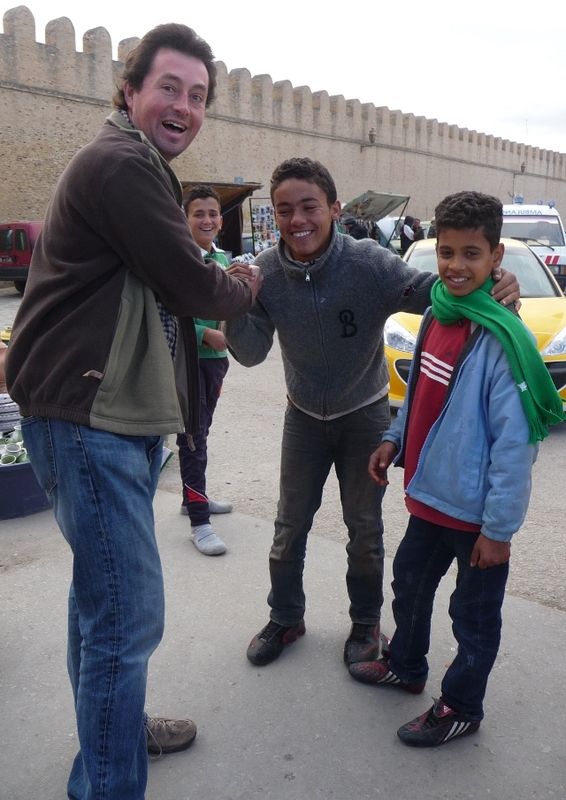 Outside the walls of the Medina, we were hailed by some charming young school boys who seemed genuinely pleased to meet and greet us in English with great enthusiasm. The second zaouia took us on rather a wild goose chase, but we found it with help of several passers by. Sidi Amor Abbada, was a nineteenth century blacksmith thought to be a bit loopy, and the domed halls surrounding his tomb are filled with some of his larger than life creations. We had a disappointing café lunch, and thus unfortified went in search of the Aghlabid Pools – quite a walk from the centre via a dusty everyday market. One corner was teaming with cats, then it dawned on us that this was the chicken section. Pick your chicken and have it slaughtered and plucked while you wait. The cats were gorging on whatever gruesome remains they could find. Amidst so much beauty, raw real life intrudes quite harshly on the sensibilities at times. The pools are restored 9th century water storage pools – round reservoirs holding water channelled here from the mountains. Apparently they became more of a breeding ground for mosquitos than a benefit to the population. Although they’re ancient and have been restored, their surroundings aren’t picturesque … not the park setting we were expecting. Nearby was our last zaouia, and the most impressive of the day, that of Sidi Sahab. 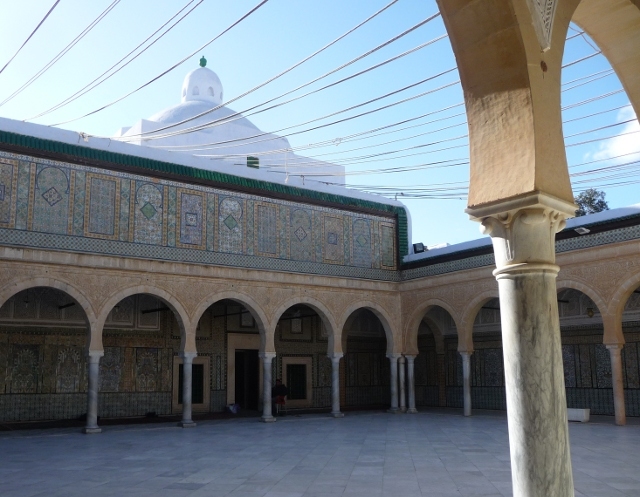 This is a particularly important and sacred place as a Sahab is a companion of the Prophet. This incredible complex of courtyards, tombs, a mosque and a medersa is still in use as the focus of veneration, study and pilgrimages. It is awe-inspiringly beautiful and we spent some time pondering its fabulous tiling and idling from courtyard leading onto courtyard. We couldn’t of course go into the prayer hall, but there was a chap on hand who would take pictures with your camera for a tip. Obviously the German couple before us didn’t give enough so didn’t get sprinkled with orange perfume like we did. (The pictures he took for us were blurred!) It was hard to leave such a beautiful place, but we were starting to flag and headed back into the centre of town. We called in for a brief visit to the free carpet museum. Sadly it was badly lit with poor explanations. A missed opportunity for this Tunisian capital of carpets! By now, after our poor lunch, we were in need of refreshment and went round the corner to a patisserie I’d spotted. We found an array of wonderful nutty biscuits and ordered a clutch of these each to accompany our freshly squeezed orange juice, for very small change. Back to our hotel to unwind and relax for a while before finding dinner. Last night we’d gone to the Sabra Café almost next door to the hotel and had a delicious meal of Koucha – lamb and potato in a tomato sauce. Tonight we went for couscous in huge portions at the Karowan restaurant round the corner. In the morning it was time to move on, with one last stop south of the city for the Reqqada Museum of Islamic Art. It was rather a let down. What they had was fabulous, but there wasn’t that much of it. 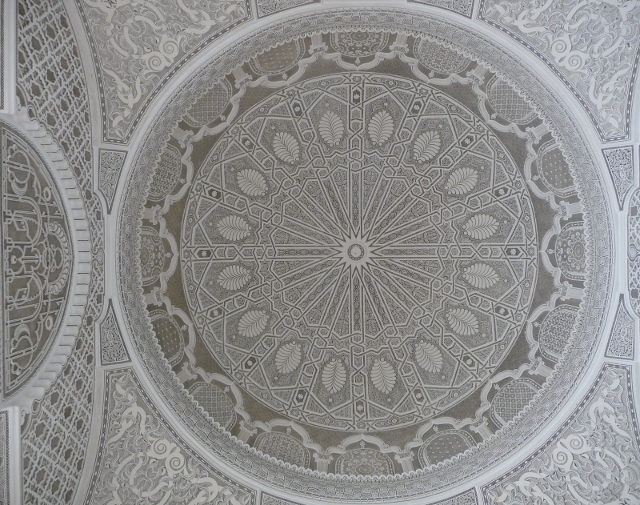 The best thing though was the intricate lace-like domed ceiling of one of the rooms, which was truly magnificent. We then headed westwards to the coast, to Sousse, dodging overtaking lorries on the way. This entry was posted in Art & Culture stuff, By Country - Tunisia, Food stuff, Travel stuff. Bookmark the permalink. That beautiful domed ceiling at the Raqquada museum! What a treat after all those Italian Assumptions and Apotheoses.